Serviceman Chuck Long installs a GenerLink transfer switch. GenerLink puts an end to the hassles and headaches of connecting an emergency generator to your home’s wiring system. GenerLink makes connecting a generator as easy as plugging in a cord. GenerLink is a collar that is inserted between your home’s electric meter and socket by a PUD service technician. Once installed, you simply plug your generator into the GenerLink. Now your home’s electrical system is powered by your generator. GenerLink automatically disconnects your home from the power grid when the generator is engaged. This allows you to operate home appliances without the hassle of extension cords, and prevents electricity from backfeeding onto power lines – electricity that could seriously injure or kill PUD repair crews working to restore power in the area. Backfeeding can also ruin your generator. How Much Does GenerLink Cost? New GenerLink installations are charged $11 a month. The charge will be added to your monthly PUD statement. There is no installation fee. A minimum commitment of 12 months is required unless you cancel your electric service at the address where the GenerLink is installed. Will GenerLink Work with My Equipment? Electric service from the PUD must be 200 amps or less. The generator’s maximum continuous power output rating must not exceed 9600 watts. The generator is rated for 120/240 volts and is equipped with a UL approved 4-wire NEMA L14-20 locking, L14-30 locking or 14-50 straight receptacle rated for 120/240 volts. View a list of compatible generator model numbers. The GenerLok power cord is the only power cord approved for use with GenerLink device. Additional lengths are available for an additional charge. The end of the cord that plugs into the outlet mounted on your generator must be one of the following: L14-20 Locking, L14-30 Locking or 14-50 Straight. How Can I Get a GenerLink Installed? 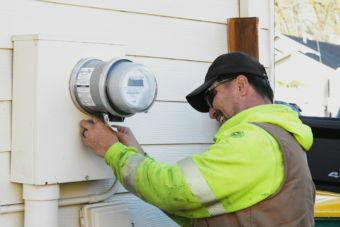 To sign up for GenerLink service, contact our Energy Experts by email or by phone at (503) 397-8155.